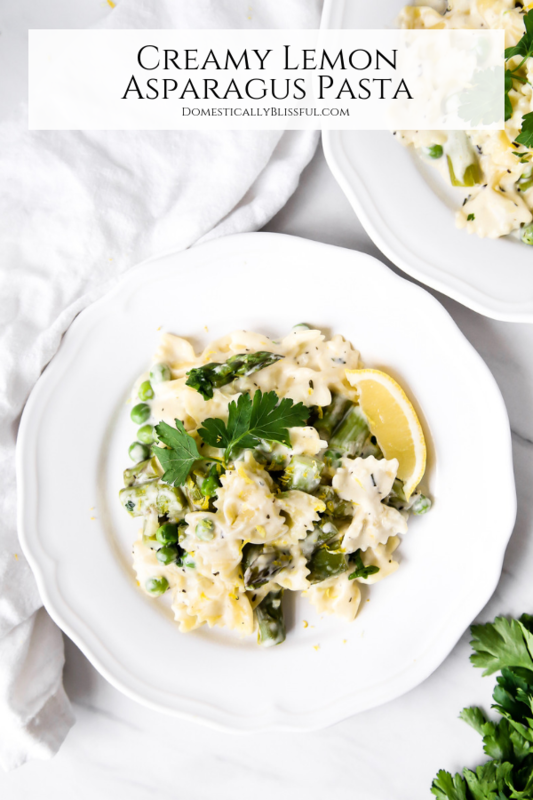 This Creamy Lemon Asparagus Pasta is a fresh spring & summer recipe filled with asparagus & peas in a creamy lemon sauce. We have finally reached the last week of March & I am so ready for the warmth of late spring & early summer. Well, honestly I’ve been ready for it since February, which is probably why I’ve already been sharing recipes like these Black Bean Mango Tacos & these Raspberry Lemon Poppyseed Muffins. 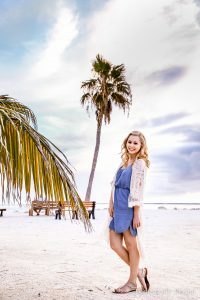 And while our weekend trips to Disney World & Charleston were fun ways to feel the warmth that is to come, they were temporary & I couldn’t bring the warm weather home with me. 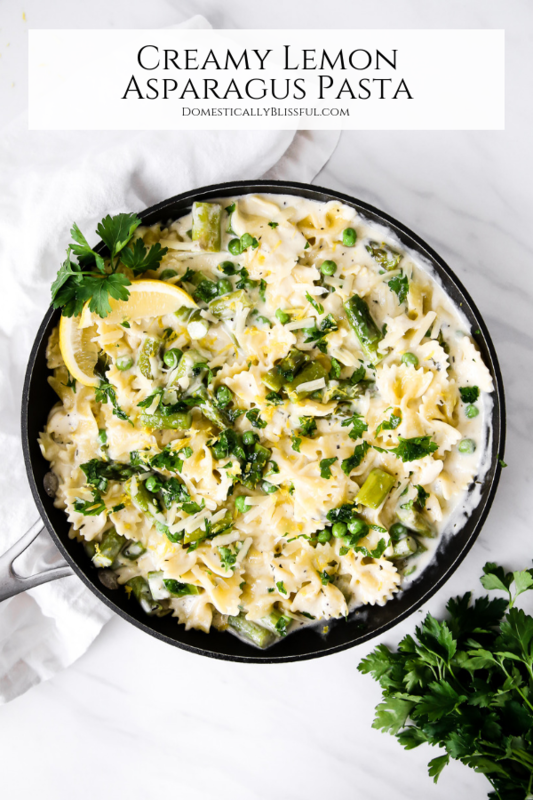 But I can make it feel like summer anytime in our kitchen by making this Creamy Lemon Asparagus Pasta! Since spring officially began last week I have decided that I can start sharing more spring & summer recipes. 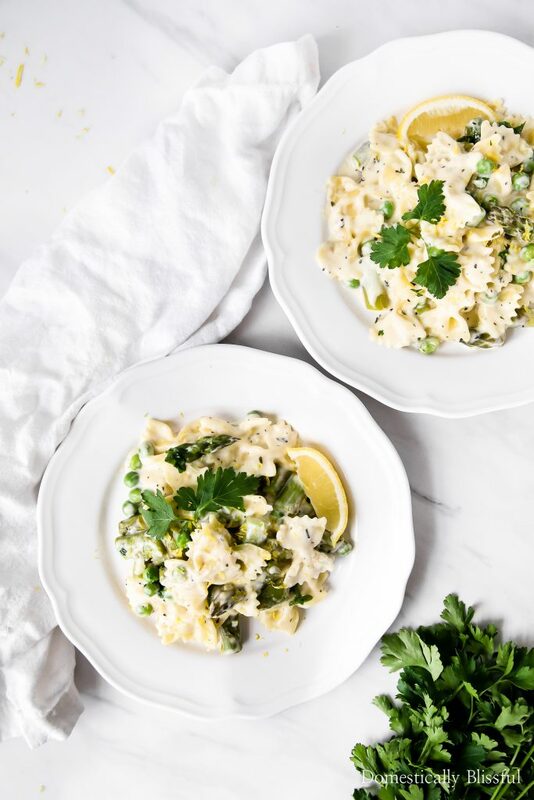 And this vegetarian pasta recipe is at the top of my list! 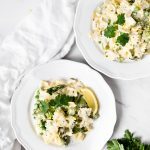 I absolutely love the colorful green vegetables & the bright flavors in the fresh lemon alfredo sauce. There is something so comforting about a creamy pasta sauce loaded with vegetables. And to give it an extra zesty presentation I topped my creamy pasta dinner with fresh parsley & a sprinkle of lemon zest. First, cook the pasta according to the packaging instructions. After about 6-7 minutes (3 minutes before the pasta is al dente) add the asparagus & peas. Cook until the pasta is al dente & then drain & toss with 1 tablespoon olive oil to prevent sticking. While the pasta is cooking, melt 3 tablespoons butter over medium-low heat in a non-stick pan & add the 3 minced garlic cloves. Sprinkle with 1/2 teaspoon parsley, 1/4 teaspoon thyme, 1/4 teaspoon basil, salt, & pepper. Cook for 2-3 minutes until fragrant. Whisk in the flour (a tablespoon at a time) into the butter until a rue forms. Then whisk in 1 cup of vegetable broth, slowly, until completely incorporated, whisking continuously. Add the 1 cup heavy cream & stir until thickened & warm. Then stir in 1/3 cup parmesan, 1 tablespoon lemon zest, & 1 tablespoon lemon juice. Gently fold in the pasta, asparagus, & peas. Serve immediately topped with an extra sprinkling of parmesan & fresh parsley. 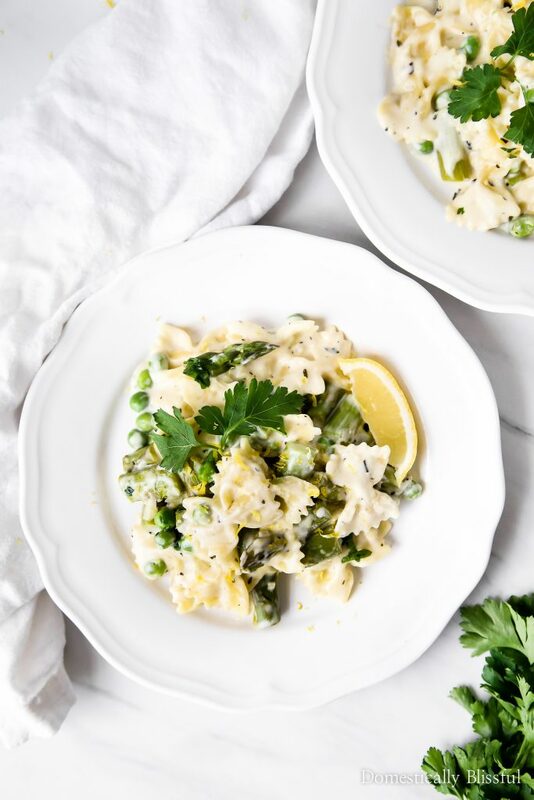 I hope you enjoy this Creamy Lemon Asparagus Pasta as we patiently wait for warmer weather! 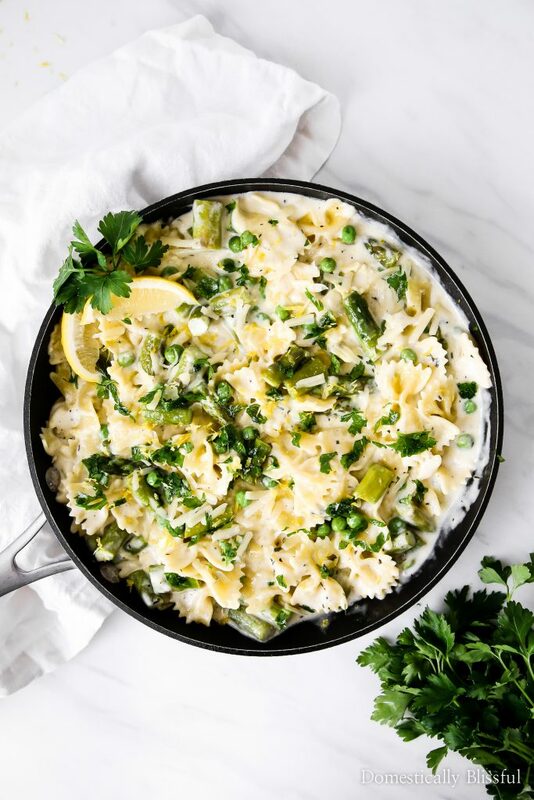 If you make this Creamy Lemon Asparagus Pasta be sure to share a picture & tag @DomesticallyBlissful on Instagram so that we can all see your delicious dinner! 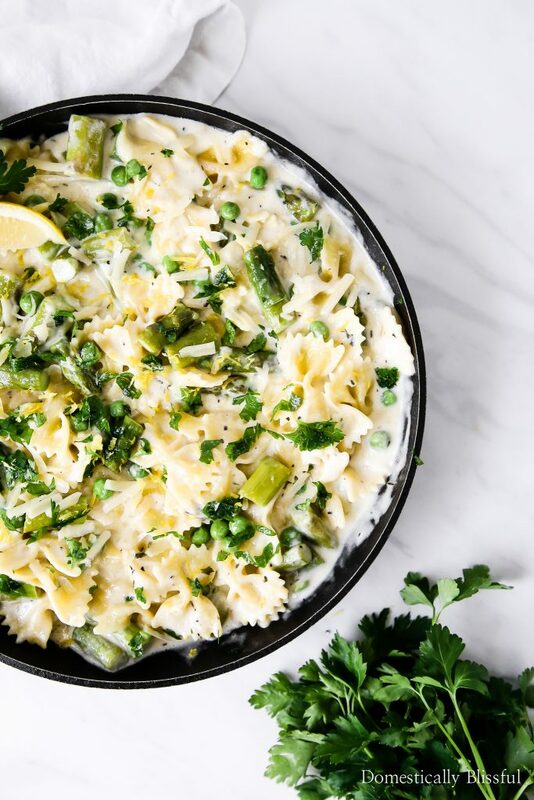 What is your favorite thing about this recipe, the lemon, asparagus, or peas?